The large animals of Gorongosa National Park were nearly wiped out during the Mozambican civil war. After the war had ended, people reported being charged and chased by the few traumatized elephants that survived. 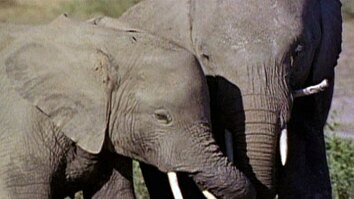 Cinematographer Bob Poole and his sister, Joyce, an elephant researcher, wondered if by running away from the elephants people were inadvertently provoking the magnificent animals. The Pooles teamed up to test their theory. Find out what happens when they stand their ground against charging elephants. There used to be more than 4,000 elephants in the greater Gorongosa area. And during the war most of those elephants were killed. Hungry soldiers ate their meat. And traded their ivory for guns and ammunition. When it was all over there was only a few hundred traumatized elephants left in the park. People spoke of being charged and chased by elephants. And having terrible experiences with them. And, having spent a lot of time in my life with elephants I thought, Well, maybe by running away under those circumstances that the people were provoking the elephants to charge. Maybe if people didn't run away from charging elephants then they would relax. You know, like most elephants do in the rest of Africa. I talked to my sister, Joyce, about it who by then had become probably the worlds leading expert on wild African elephant behavior. And she agreed. So, she came to Gorongosa to see for herself. The first thing she had to do was identify elephants in the population. And that meant taking photographs and then video so that she could study the behavior. We both agreed that we wouldn't run away from charging elephants. And so I built this metal frame for my Land Rover, to protect us. If I was wrong about the charging elephants. So we went to work. And when elephants charged we simply just turned off the engine and sat quietly. Charge after charge the elephants came and they never hit us. And so, we felt vindicated for the idea, and that... Joyce was able to get a lot of good photos and start to identify members of the population. It felt like we made real headway with this population and that we had the answer. Yeah, it was wonderful. We got to know some of these elephants and they really did calm down. And, one day I was out with Greg Carr and a ranger named Maveneco. And the elephants were eating these Acacia Albida seed pods they are like candy for the elephants. They just love them, and they were busy eating those things and eating all around the car while the babies played and it was absolute magic. We never had an experience like this in Gorongosa with elephants. And, soon... or later the elephants moved on and it was late and we had a long way to go back to park headquarters. And on our way an elephant had knocked this tree down, across the road. And it was just starting to get dark. And so I flicked my lights on and I bashed my way through the forest around the tree. And suddenly I heard elephants trumpeting on my left. And I looked up to see three big adult females charging straight at me. And so, I switched off the car and we all sat quietly while one of the elephants came forward. And she towered above the car. And she raised her trunk and she smelled us. And she gazed down at us through the bars of the open vehicle. I wasn't too worried though because it was normal. You know, it was only a matter of time before she'd just backed slowly away and joined the rest of the herd and we'd be free to go. But she didn't. She just stood there. And time passed and I started to worry a little bit. And then suddenly she lowered her head and with the full force of her body she slammed into the front of the car. She hit so hard that she blew the tire off the rim on the other side. And the protective body armor and the vehicle panels just collapsed. And simultaneously I heard this bang go off. And I didn't realize until later it was the sound of Maveneco's .458 which is a huge caliber rifle. You know, the bullets are like this. It's an enormously loud noise. And the elephant backed away. He shot a warning shot over her head and she backed away. I thought it would be a good idea to give her some more space. So, I turned the car on and I backed up a little bit. At which point she put her head down and charged again this time straight between the headlights. And with my hands on the wheel she drove us backward with her head pressing against the bars in front of me and they buckled. I kept trying to steer the car. But I had zero control. I didn't want her to spin us sideways where we would easily flip and she'd just pummel us. But she drove us backwards and we slammed into a tree at which point Maveneco shot another... shot at point blank over her head. And she backed away again, this time into the forest. So, I pulled the car back out onto the track and we jumped out to try to change the tire. At which point she charged again... And Maveneco fired his last warning shot. They're given three warning shots. Luckily she never came back. My car was a wreck. But the bars had held and no one got hurt. I was devastated though. My confidence with the elephants was completely shattered. And I was no longer willing to hold my ground against charging elephants. But Joyce was there, and she wanted to keep going. So, where to begin? Clearly we had a lot of work to do. She wanted to study what takes place before and after they charge, the behavior. And I was intimidated. I didn't want to get close to these elephants and I certainly didn't want to stand there and get charged any more. So, I always had to have a clean out and my hand on the ignition. What I am trying to do right now is to get to know the individuals. And one of the reasons for that is to find out are there just some individuals who are really aggressive or is it all of them who are aggressive. So, in order to find this out I actually have to know them. I am sure we're the first people who have been here other than poachers, I'm positive. I always liked that feeling when I was a kid. -I'm the first person to be here. I think you don't need that. Oh gee! That was so stupid. Startling them is the last thing I want. I'm sorry. Now I've got you worked up. I never do that, it never happens to me. Being smashed by these elephants is too fresh in my mind. She's pulling back. I'm telling you just be quiet. There was no other way to go towards them. Not like I've been smacked... I've been smacked. We were pushed around like a matchbox. Alright let's... Let's just focus on getting the pictures again. A rocky start but at least she's got an ID shot. Well, sooner or later Joyce decided to stop holding her ground against elephants, too. And partly because of these guys. This is a family we call the Mbenzis. And they always charged. The matriarch is the one on the left this elephant here with the crumpled ear. She earned the name Provacadora. Because she would also lead her companions into group charges at us. We spent a lot of time with them, however, and what we learned to do is keep our distance from them. And this one particular day we had followed them at a distance into one of these fever tree forests. And when the elephants came towards us we backed away and gave them lots of space and when they stopped, we stopped. And then as the day went on we were able to get closer and closer and they sort of relaxed around us, which was nice 'cause it was a breakthrough with this family. But... then Provacadora showed up and she led these guys into a two-and-half minute chase after us through this forest. We went as fast as we could through the forest and barely just got away from them. But the coolest thing about the whole thing was they won, we lost and they celebrated with what became known as an end zone dance. And it was amazing really. Joyce saw this as an incredible piece of behavior. And this kind of clanking of the ones that had tusks and this wrapping of trunks together and bellowing, you can see with their mouths open there. You know this family hadn't been torn apart by years of war. It had been bonded together. 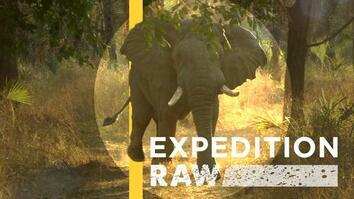 And so we got some insight into these elephants through this experience. And interesting that they won. They also realized that in the end we weren't so bad, I think. Because they started to allow us to get closer to them more frequently. And we had some other incredible encounters.